Objective: This retrospective study was aimed to evaluate the radiographic and clinical results of polyaxial locking compression osteosynthesis system and bone grafting for the Extended Trochanteric Osteotomy (ETO) in artificial femoral component revision with severe osteolysis of greater trochanter. Methods: 38 consecutive patients were operated on for the ETO in artificial femoral component revision, with a mean follow-up of 48 months (range, 24-84 months). 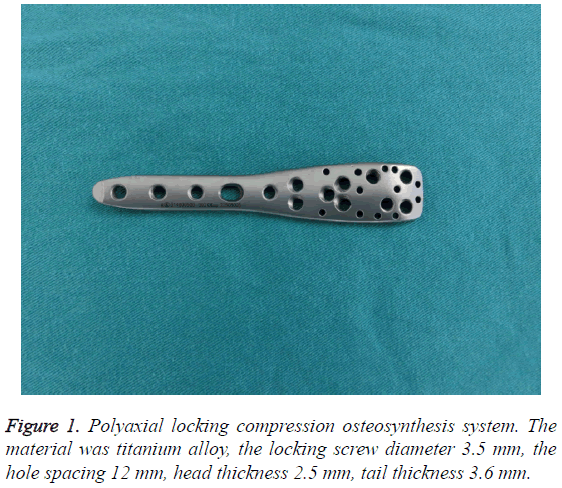 The trochanteric fixation was achieved with polyaxial locking compression osteosynthesis system on the lateral surface of the severe ostelyic greater trochanter. The bone graft was subsequently performed at the osteolytic site. Results: Trochanteric union was achieved in all patients (100%). All the osteotomies were not displaced. The preoperative Harris hip score was 40.18 ± 6.23, at final follow-up, the Harris hip score was 81.45 ± 10.68, showing significant difference when compared with preoperative score (P=0.001). The muscle strength of the gluteus medius and gait were respectively evaluated in accordance with the standards of five classes and Trendelenburg sign, showing significant difference before and after operation (P<0.05). No cases needed painful hardware removal. Bony regeneration was an early and significant finding in most cases. We identified no evidence of breakage, bone obsorption or other complications directly attributable to the locking compression plate. Conclusion: The severe ostelyic greater trochanter can be successfully fixed with polyaxial locking plates for the extended trochanteric osteotomy during total Hip Arthroplasty (THA) revision. We did not observe any complications directly related to the polyaxial locking compression osteosynthesis system. Total hip arthroplasty, Revision, Extended trochanteric osteotomy, Greater trochanter, Osteolysis, Locking compression plate. The Extended Trochanteric Osteotomy (ETO) popularized by Younger et al. has been proved to be an effective method in many revisions, such as Total Hip Arthroplasty (THA) and complicated primary THA [2,3]. Advantages of ETO include larger exposure during operation, lower risk of the femoral facture, improvement of gluteus medius tension and larger contact area for healing of the osteotomized bone, etc. [4,5]. The wires, cables and cable grip were applied in the early ETO fixation to strengthen the greater trochanter . The recent fixations were improved to utilize suture cord and nonmetallic cable . However, the initial popularity for these techniques has declined due to the high complication rate published in several clinical studies . Moreover, many patients seek medical attention when they have reached a severe stage of osteolysis, especially in developing countries because of work responsibilities, financial difficulties, etc. Therefore, their greater trochanter osteolysis becomes severer when they seek surgical intervention. Stabilization of the greater trochanter offer one of the greatest challenges in this kind of revision of THA . No clear standard of care has emerged as to the most efficacious fixation modality for ETO. The present study aimed to take advantage of the polyaxial locking plate technology to improve our results for the fixation of fragile osteopenic greater trochanter in ETO. 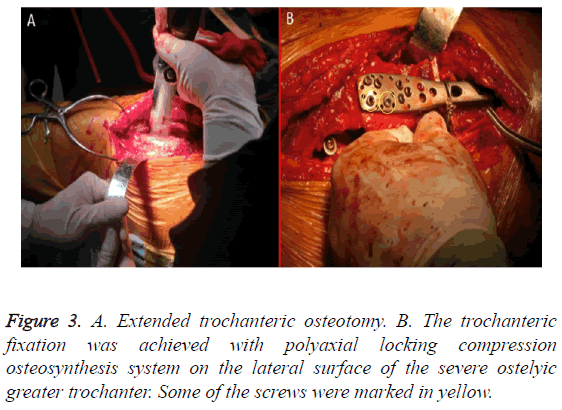 From December 2006 to December 2013, 38 consecutive patients were operated on for the extended trochanteric osteotomy in revision THA using the polyaxial locking compression osteosynthesis system (Figure 1). The average age was 61 y (range, 39-78 y), and there were 23 men (23 hips) and 15 women (15 hips). All patients were followed up for a minimum of 2 y. All patients suffered from severe osteolytic lesions in greater trochanter. The deficiency in the proximal femur was classified according to the system of Paprosky; there were 4 Type II, 14 Type IIIA, 12 Type IIIB, 8 Type IV (Table 1). Table 1: Basic clinical data of the patients. Figure 1: Polyaxial locking compression osteosynthesis system. The material was titanium alloy, the locking screw diameter 3.5 mm, the hole spacing 12 mm, head thickness 2.5 mm, tail thickness 3.6 mm. According to the classification of acetabular bony deficiencies of the American Association of Orthopedic Surgeon (AAOS), 5 cases were classified as type I, 13 cases as type II, and 20 cases as type III. The causes for revision were aseptic loosening in all cases. The time from hip arthroplasty to revision was 6-15 y. In this research, femoral revision used uncemented grit-blasted and fluted modular tapered prosthesis stem (Link MP Waldemar Link, Hamburg, Germany or Lima, Italy), and acetabular revision used Jumbo cementless cup (Figure 2) . The patient was placed in a lateral decubitus position on a radiolucent table to allow fluoroscopic imaging. The original incision was used to expose osteotomy site with dissection on each side of the gluteus medius to elevate the greater trochanter. Using an oscillating saw, the greater trochanter was cut distally to remove the previous implant. The vertical cutting positions were at the anterior and posterior side of the proximal femur. Distal prosthesis for revision over the greater trochanter osteotomy is 4 cm. The horizontal cut was one third of the girth and joined both sides of the vertical cuts. This process required minimal dissection of the vastus lateralis from the posterolateral femur. 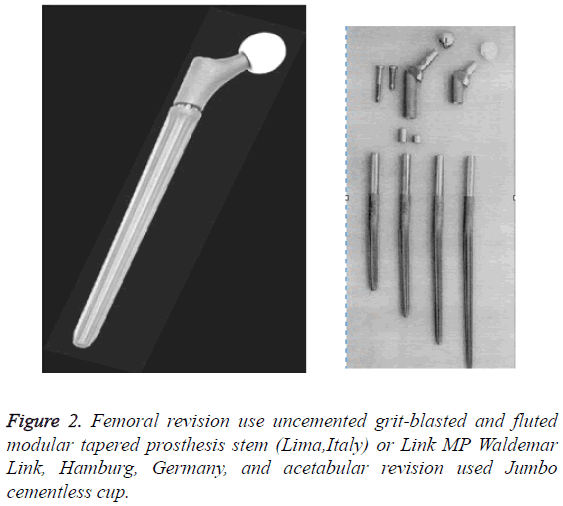 Figure 2: Femoral revision use uncemented grit-blasted and fluted modular tapered prosthesis stem (Lima,Italy) or Link MP Waldemar Link, Hamburg, Germany, and acetabular revision used Jumbo cementless cup. After replacement of the prosthesis and restoration greater trochanter, a proximal humerus polyaxial locking compression plate osteosynthesis trochanteric plate (Changzhou kanghui medical devices Co, LTD.) was used to connect the osteotomy site. The fixation was on the lateral surface of the severe ostelyic greater trochanter. The plate with combi-holes was initially stabilized with 3.5 mm locking screws in the proximal ETO fragment, and then compression was achieved at the osteotmy site with unicortical screws inserted distally in the femoral shaft (Figure 3). Figure 3: A. Extended trochanteric osteotomy. B. The trochanteric fixation was achieved with polyaxial locking compression osteosynthesis system on the lateral surface of the severe ostelyic greater trochanter. Some of the screws were marked in yellow. 3-4 cerclage wire fixations were done in the distal segment to secure the construct and prevent detachment of the unicortical screws. The wires were tightened manually by pliers. The impaction bone graft was performed at the osteolytic site. Material of bone transplantation was derived from the posterior superior iliac spine. Autogenous morselized cancellous bone was placed at greater trochanter by compression grafting. In our study, augmentation with a tension band construct using non-absorbable sutures through the gluteus medius to the holes in the plate was applied in 38 cases. Postoperatively, the patient was not allowed to bear weight and actively abduct for the first 6 w, and then progressive weight-bearing was allowed according to the X-ray films. The measurement data was expressed by mean ± SD. Independent continuous variables were compared using the Student t-test. It was considered to be statistically significant when P-value was less than 0.05. All calculations were made using SPSS 18.0. The mean follow-up was 47 months (range, 24-84 months). No patients were lost to follow-up. All patients underwent both clinical and radiographic evaluations immediately, postoperatively, at 6 w, 3 months, 6 months, and then annually thereafter. Clinical and radiographic evaluation was performed by two observers whom did not partake in the surgeries. Functional outcome scores of all patients at the final follow-up are presented in Table 2. Table 2: Functional outcome scores of all patients at the final follow-up. The preoperative Harris hip score was 40.18 ± 6.23; at final follow-up, the Harris hip score was 81.45 ± 10.68 showing significant difference when compared with preoperative score (t=0.132, P=0.001). Similar results were also found with the womac score (59.46 ± 8.24 before operation and 42.12 ± 3.67 after operation). Pain was measured on a Visual Analog Scale (VAS) (5.32 ± 1.45 before operation and 1.01 ± 0.14 after operation). Healing of the osteotomy was determined by clinical examination. In patients with union recovery, 7.89% were limping, and 5.26% required a walking aid. Restoration of abductor function was noted clinically by measuring abductor muscle resistance using the standards of five classes compared with the contralateral hip. Trendelenburg sign was positive in 2 patients at the latest follow-up. No infections or dislocations were seen. No patients underwent hardware removal for trochanteric pain or bursitis. In total 96% patients were satisfied with the operation. An anterioposterior radiograph of the pelvis was taken at every visit during follow-up (Figure 4). The femoral components were noted to be well fixed in all patients. Trochanteric union was analysed by radiographic evaluation. This included: bony union, if there was continuity of bone trabeculae between the trochanter fragment and the site of attachment; fibrous union, if a continuous radiolucent line between the trochanter fragment and the site of attachment was present with migration less than<15 mm and non-union, if more than 15 mm migration of the greater trochanter was measured. The initial postoperative X-rays served as a baseline to which all subsequent radiographs were compared . X-ray image showed that the trochanteric union rate was fully achieved without trochanteric migration. Figure 4: A. A 64 y old female patient with hip prosthetic aseptic loosening after 12 y of bilateral total hip arthroplasty. A 64 y old female patient, bilateral total hip replacement for avascular necrosis of femoral head 13 y ago suffered from severe osteolytic lesions in greater trochanter and prosthesis loosening; B. Revision following primary total hip replacement by Osteosynthesis System and particles bone graft; C. Seven years following left total hip arthroplasty revision, the prosthesis was well positioned, without obvious sinking, without obvious Greater trochanter osteolysis. D. A 61 y old female patient before the revision, severe osteolytic lesion could be seen on the radiograph. E. Radiograph of the 61 y old patient 12 months after revision when followed up, the bone mass of the greater trochanter bone was restored. 26 stems were in neutral position and 12 were in slight varus. 32 (84.2%) stems had good canal fill, there were no change at the latest follow-up, 6 (15.8%) hips had osseointegration. Roentgenographic results of femoral components showed 3 (7.89%) hips with local radiolucent line, 2 (5.26%) hips with cortical hypertrophy around the distal prostheses, 2 (5.26%) hips with osteolysis and 31 hips were considered stable, with no circumferential lucencies at the distal fixation surface. 2 hips had nonprogressive migration of 1 to 2 mm. Pedestal formation was found in 2 (5.26%) hips. No bone absorption around the screw, plate and wire was seen in all patients. No locking plate or screw loosening or fragmentation was found in all the patients. No osteolysis at the site of screw attachment to the prosthesis suggests there will be no debris particles between femoral stem and screws. When loosening was used as the end point for failure, the survival rate of the femoral component was 1.0 (95% confidence interval 0. 98 to 1. 00). The Extended Trochanteric Osteotomy (ETO) is known to be a useful technique for patients requiring complex revision THA. The traditional ETO technique as described by Younger et al. in 1990 utilizes a posterior approach to the hip. This technique helps to achieve correct alignment of the prosthetic components, especially in angular deformities of the proximal femur and so on, and permit the ability to favorably influence the abductor lever arm. ETO allows excellent exposure of the proximal femoral canal, which facilitates resection of the canal's contents during revision total hip arthroplasty, particularly at extraction of a well fixed cementless femoral stem or a cemented stem. Moreover, stenoses in hip joint space are always due to subsidence of femoral component and acetabular cup loosening, the extended trochanteric osteotomy additionally provides outstanding exposure of both acetabular and femoral sides. Awareness about biomechanics of ETO, indications, implants selection, fixation techniques and complications is paramount for good intraoperative and postoperative outcome . The wires, cables, cable grip and nonmetallic cable were applied in ETO fixation to strengthen the greater trochanter but the disadvantages of this kind of fixation are obvious. The nonunion rates range from 20% to 31%, and cable breakage is seen in 10% to 19% with the existing systems. Non-union of the greater trochanter after trochanteric osteotomy can lead to persistent abductor weakness pain and dislocation of the prosthesis. Multifilament braided cable tends to fatigue and fray leading to a multitude of new problems including release of metallic particulate debris into the body which accelerated polyethylene wear and acetabular loosening. Initial cable relaxation of more than 50% may limit their ability to maintain compression during the healing period, so does other fixation devices. Bone absorption around the cable, grip was seen in as many as 70.6% in the Dall-Miles cable grip system. According to Haddad et al. , initial cable relaxation of more than 50% may limit their ability to maintain compression during the healing period. Moreover, wire technique has complications of wire migration since it is very difficult for the greater trochanter’s irregular surface to keep the wire stable. It is also important to note that the greater trochanter often has severe osteolysis, so the use of tight wires will cut the osteopenic bone, resulting in the loss of fixed force and higher risk of iatrogenic fractures. If revision THA is performed at right time, it would decrease intra-operative complication and also relieve stress on surgeons. Unfortunately, patients usually do not seek for surgical treatment until symptoms is very serious in many developing countries. By that time, greater trochanter often exist severe osteolysis in most cases. It is critical that stability of the prosthesis and union of the greater trochanter osteotomy by the exact fixation technique in ETO with severe greater trochanter osteolysis. Stabilization of the greater trochanter offer one of the greatest challenges because of hard to fix in deficient bone. The force of the greater trochanter varies with different motions and states of the hip, Anteroposterior, vertical and most importantly, rotational forces act upon the trochanter. A three-dimensional biomechanical model of the hip musculature has shown that in the flexed hip, the gluteus medius is primarily an internal rotator and secondarily a flexor and abductor . The forces acting through the trochanter in the vertical plane are double an individual's body weight during normal walking. Alternatively, AP forces can increase up to 4 times the body weight, during stair climbing where the hip is flexed. Contraction of the gluteus medius and minimus applies a rotational force that cannot be fully countered by the force created by the short lateral rotators . Trochanteric fixation must resist multi-directional forces in daily activity. The key to union of the ETO is to maintain the stabilization of osteotomy site in the early stage and prevention of stress interference. The stability of the great trochanter is favorable to avoid postoperative dislocation in early abductor rehabilitation period. As we know, abductor dysfunction is main causes for dislocation . Compared with traditional plating, the advantage of fixation fundamental of polyaxial locking osteosynthesis system is angular stability. The angular stability of locked screws allows the applied load to be more evenly distributed amongst the component screws, avoiding significant load concentration at a single screw-bone interface . Furthermore, polyaxial locked plates provide enhanced stability for short segment fixation, osteoporosis, and allow screw angling around prosthetic components. Locking screws from plates converge to capture the osteopenic bone of the trochanter. Glassman emphasized the need to stabilize the trochanter not only against cephalad migration but also against the anterior pull exerted by the abductors when the hip is in flexion . Polyaxial Locking Compression Osteosynthesis System can resist the translation and the rotation. Locking plate technology was applied to the trochanter aiming for absolute stability. It is an effective method for eliminating the micro-motion of the fixed fragment. In this kind design, the screws and plate form an independent unit, which is more favorable bone and screw interface stability without friction between the plate and cortex reducing screw loosening. Multidirectional convergent and divergent locking screws enhance the grip force and primary stability of fixation, especially in deficient proximal bone stock. Biomechanical data suggest that these implants can resist physiological loads in osteoporotic bone. Moreover, locking screw in different directions can offer crossing angle fixation and cover the entire greater trochanter. It provides multi-directional and multi-hole selection for Orthopedist basing on the quality of the bone. Screw-plates provided either greater or equal stiffness compared to cable-plates in biomechanical examination for periprosthetic femur fractures near the tip of a total hip arthroplasty . Other advantages compared to conventional cerclage wire and cables are reduced compromising of periosteal vascularization and bone absorption through minimal pressure between the plate and periosteum. Locking compression plate can prevent fixation cut-out the osteoporotic bone. There are suture holes designs in polyaxial locking osteosynthesis system. Suture augmentation in a tension band configuration was performed using the non-absorbable sutures that were passed through the gluteus medius and hole to secure the gluteus medius fixed in the locking plate. It will help patients restore abductor function. If greater trochanter be moved down to strengthen deficient abductor mechanism, plate fixation is a better choice than wire, cable and grip fixations. Because the distal and proximal parts of ETO can be fixed effectively by long locking plate. The osteotomy segment will obtain stability by locking compression mechanism in polyaxial locking compression osteosynthesis system, which out stands binding fixations and promotes bone healing. In addition, the implants for fixing the greater trochanter used is relatively low profile and smooth, the smaller size and smooth regions help prevent soft tissue irritation, such as pain and bursitis over the greater trochanter. Polyaxial locking compression osteosynthesis system fixation in restoring severe osteopenic greater trochanter stability in ETO is an effective method. It is a simple procedure, which can be easily reproduced. Blood loss is relatively minimal due to operative time shorten. The plate should be slightly bent into the shape of the greater trochanter for some patients. The polyaxial locking compression osteosynthesis system fixation is not expensive compared to the cable grip, and is universally available. With the help of locking compression plate, proximal femur can gain strong support to carry the prosthesis. Locking compression plates permit the insertion of nonlocking screws, which is useful, as these are not restricted by the angle of insertion to the same extent as locking screws. This thereby enables placement of the screws anterior or posterior to the stem to obtain bicortical fixation . The cerclage wire fixations were done in the distal segment to secure the construct and prevent detachment of the unicortical screws. The cerclage wires are similar to cables in their effectiveness and are less expensive . By using the Polyaxial Locking Compression Osteosynthesis System, the broad plate is better than the fixating wires because the wire is too slim to provide adequate support to the bone. With the support of the locking plate, the operator can apply pressure at the time of the bone graft. The key to this technique is that the screw corresponding to the parts of the prosthesis must accurately measure the length. The wires must also be tightened and retightened otherwise the osteotomy fragment will not fit closely. The patient of ETO with severe greater trochanter osteolysis subsequently underwent osteosynthesis using a proximal humerus polyaxial locking plate with bone graft, leading to promise but require further clinical studies to validate their efficacy and safety. The osteosynthesis system provides the stronger fixation and results in lower rates of non-union and trochanteric migration. But our study is retrospective study; consequently, the patient evaluations were subjective. A future prospective randomised study should also corroborate these findings. Based on our experience, we recommend this technique as a modality for selective fixation for ETO in revision THA with severe greater trochanter osteolysis. There was co-building major project of Zhejiang Provincial Health Commission; Chinese National Health Commission was funding source for this study (WKJ2014-2-002); Special funds of science and technology project of traditional Chinese medicine of Zhejiang Province (2014ZA004). This study was approved by the first affiliated Hospital of Soochow University, research ethics committee. Lakstein D, Kosashvili Y, Backstein D. The long modified extended sliding trochanteric osteotomy. Int Orthop 2011; 35: 13-17. Sonohata M, Tajima T, Kitajima M. Total hip arthroplasty combined with double-chevron subtrochanteric osteotomy. J Orthop Sci 2012; 17: 382-389. Khanna G, Bourgeault CA, Kyle RF. Biomechanical comparison of extended trochanteric osteotomy and slot osteotomy for femoral component revision in total hip arthroplasty. Clin Biomech 2007; 22: 599-602. Lim SJ, Moon YW, Park YS. Is extended trochanteric osteotomy safe for use in 2-stage revision of periprosthetic hip infection? J Arthroplasty 2011; 26: 1067-1071. Jr PP, Head WC, Jr ER. An extended trochanteric osteotomy for revision total hip replacement. Bone Joint J 1993; 75: 158-159. Nicholas TT, Glenn DW, Brett RL. Early Experience with a Novel nonmetallic cable in reconstructive hip surgery. Clin Orthop Relat Res 2010; 468: 2382-2386. Paprosky WG, Martin EL. Cemented stem failure requires extended trochanteric osteotomy. Orthopedics 2003; 26: 28-38. Zarin JS, Zurakowski D, Burke DW. Claw plate fixation of the greater trochanter in revision total hip arthroplasty. J Arthroplasty 2009; 24: 272-280. Rudelli S, Honda E, Viriato SP, Libano G, Leite LF. Acetabular revision with bone graft and cementless cup. J Arthroplasty 2009; 24: 432-443. Sambandam SN, Duraisamy G, Chandrasekharan J, Mounasamy V. Extended trochanteric osteotomy: current concepts review. Eur J Orthop Surg Traumatol 2016; 26: 231-245. Haddad FS, Barrack RL, Ries MD. Factors influencing cerclage cable tension loss during surgery. AAOS Scientific Exhibit. Annual Meeting ed. San Francisco, CA, American Academy of Orthopaedic Surgeons 2004. Dostal WF, Andrews JG. A three-dimensional biomechanical model of hip musculature. J Biomech 1981; 14: 803-812. Strauss EJ, Schwarzkopf R, Kummer F, Egol KA. The current status of locked plating: the good, the bad, and the ugly. J Orthop Trauma 2008; 22: 479-486. Miner TMMN, Chong D, Paprosky WL. The extended trochanteric osteotomy in revision hip arthroplasty: a critical review of 166 cases at mean 3-year, 9-month follow-up. J Arthroplasty 2001; 188-194. Hoffmann MF, Lotzien S, Schildhauer TA. Outcome of periprosthetic femoral fractures following total hip replacement treated with polyaxial locking plate. Eur J Orthop Surg Traumatol 2016. Glassman AH. Complications of trochanteric osteotomy. Orthop Clin North Am 1992; 23: 321-333. Lever JP, Zdero R, Nousiainen MT. The biomechanical analysis of three plating fixation systems for periprosthetic femoral fracture near the tip of a total hip arthroplasty. J Orthop Surg Res 2010; 5: 45. Yeo I, Rhyu KH, Kim SM, Park YS, Lim SJ. High union rates of locking compression plating with cortical strut allograft for type B1 periprosthetic femoral fractures. Int Orthop 2016; 40: 2365-2371.